Your creative mind can make use of trims and laces not only to develop the beauty of your dress but also to make well-designed home decor pieces. Trims and laces select correctly to complement the color and fabric of your clothing that will help you to convert a simple outfit to an elegant one. Use our floral lace ribbon that is the best option for your decoration purpose and makes your floral design arrangement beautiful. 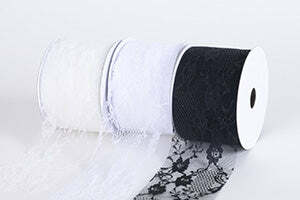 There is a vast range of these lace ribbons that are available in our online store at affordable price. You can choose the one with perfect color, shape, and design. They also offered in varied materials like cotton, silk, wool and linen. You can put them onto different apparels such as your pillows, dance wear, tablecloths, wedding gowns, etc. Flowers play a significant role in setting the scene for a wedding. Concentrate on the flowers on the marriage dress, instead of focusing on the bouquet. Use them on the bodice, combined with beads and sequins for a stand-out look. Add them to the skirt, highlighting the lines of the waistline or the flare from the hips.